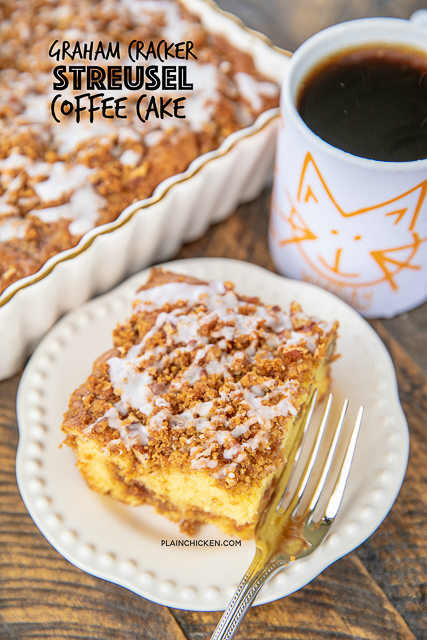 I love a good coffee cake for breakfast, and this Graham Cracker Streusel Coffee Cake is one of the best! 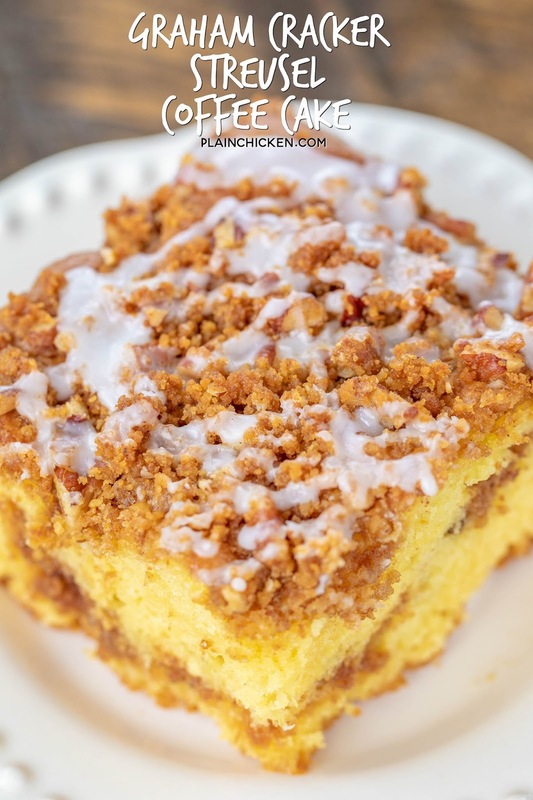 SO moist and the streusel topping is to-die-for! All you need is a cup of coffee and you are set! 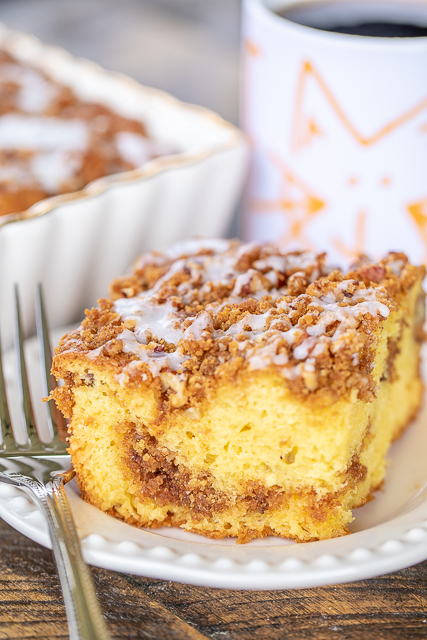 The batter of this Graham Cracker Streusel Coffee Cake starts with a box of cake mix. I doctored it up with a box of vanilla pudding and some sour cream. SO easy! 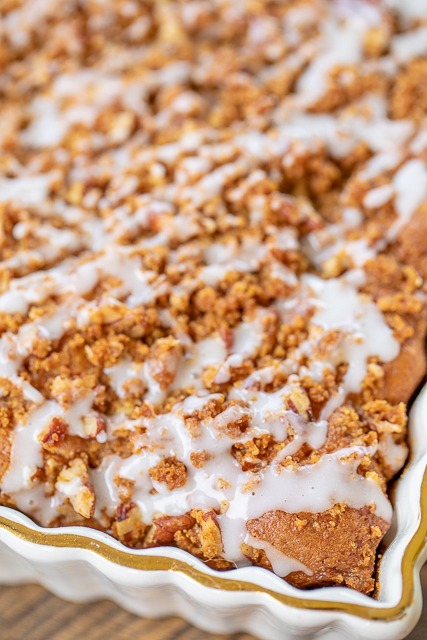 The streusel topping has graham cracker crumbs, brown sugar, cinnamon and pecans. Seriously delicious! We had zero self-control around this yummy cake. We had to give it away to stop eating it. LOL! 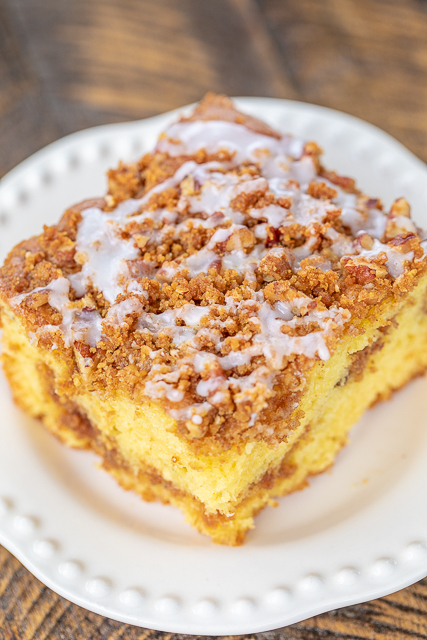 This Graham Cracker Streusel Coffee Cake is great for overnight guests, brunch, potlucks and dessert. We like to serve the cake slightly warm. We pop our slices in the microwave for a few seconds before we dig in. The cake will keep for several days in an air-tight container. Give this a try ASAP! I promise you won't be disappointed. Preheat oven to 350ºF. Grease and flour a 9x13-inch cake pan. In a large bowl, combine cake mix, pudding mix, sour cream, eggs, oil and vanilla. Beat with an electric mixer for 2 minutes. Combine graham cracker crumbs, brown sugar, pecans, cinnamon and butter..
Pour half of cake batter into prepared pan. Sprinkle with half of graham cracker crumb mixture. Pour remaining batter on top and prinkle batter with remaining graham cracker crumb mixture. Bake for 40 to 45 minutes, until a toothpick inserted in center comes out clean. Cool on a wire rack. Combine powdered sugar and milk. Drizzle over cake. This coffee cake is amazing! I am getting ready to make it for the second time in 2 weeks! Do you think it can be frozen? Before or after baking?